I don't know about you, but I always have the hardest time ever coming up with good presents for Grandpa for Father's Day. Let's face it, at 60 (+), they already have enough ties, they don't need anything, and they don't really want much either. Luckily, for one side of the family, we have the only grand kids. So anything I give with my child's face on it means he will like it. So here's my super duper, incredibly easy father's day present. Step One: Make a picture. 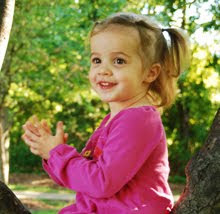 If you have Photoshop, or some other scrapbooky program, you could easily throw together a picture like mine. This actually a quickpage from Queen Pamedalah , which means I just stuck some pictures in the slots. SUPER EASY!! The hardest part was picking out the pictures. 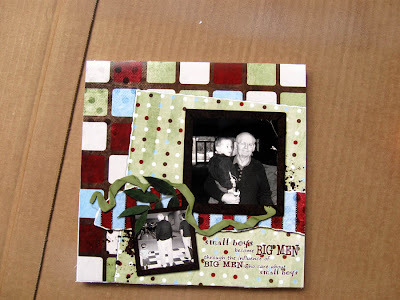 (For more quick pages, check out the options on DigiSrapDepot I'm a huge fan of freebies. Huge). 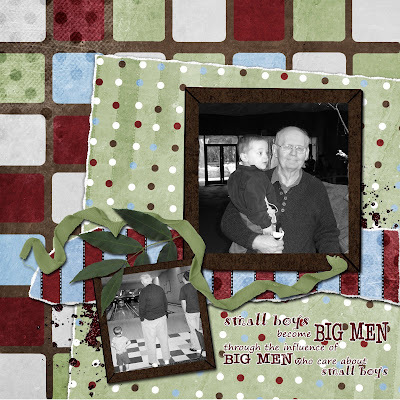 If you don't have photoshop, or aren't into digital scrapbooking (but really, you should try it. I LOVE IT!! 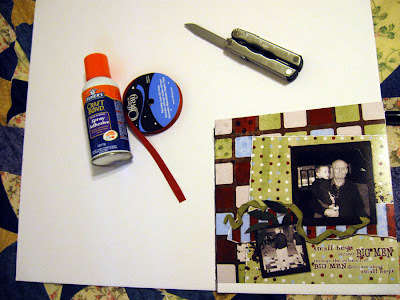 Sorry, I'll stop now), you could do just one big picture, or paper scrap a page. Step Two: print the picture. I've heard lots of people that print their stuff out at Costco. I checked their prices, and for square photos, you can't beat them. However, I don't have a membership, so I need other options. 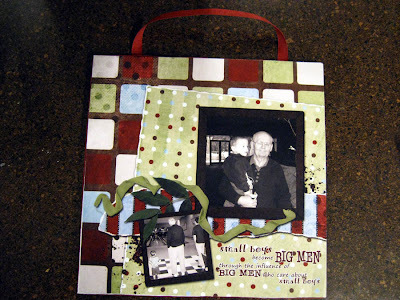 My original page was 12 x 12. In Photoshop, I opened a new page with the same resolution, but an 8 x 10. Then I changed my page to 8 x 8, and dragged it over, and saved it as a jpeg. Then I uploaded it to Walmart's photo center and ordered it 1 hour (the price for 8x10s are the same regardless of how you print them, so just do 1 hour). Make sure you preview it to be sure it's going to be on the page the right way. 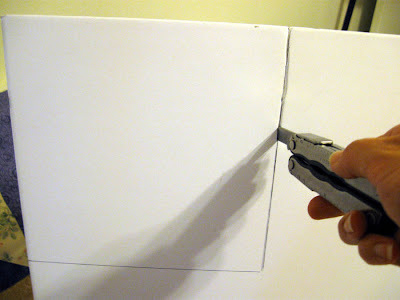 Step 4: Cut white parts off the picture, and then trace it on the board. I like to use a ruler, since I seem to be incapable of drawing a straight line otherwise. Step 5: Cut out the board. I used my hubby's Leatherman. It helps to score it a bit first, but since it's just foam board, it really does cut super easy. Don't stress that the edges aren't perfect, we'll fix them in a minute. 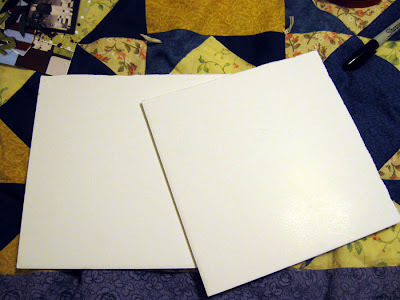 Step 8: check and make sure that you have the boards the right size. Then sand the edges. 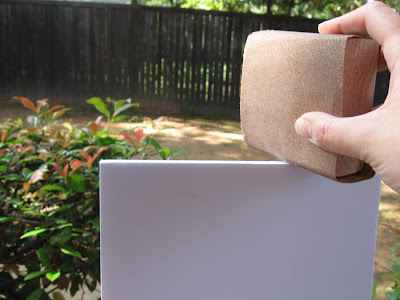 If you have a scrap board to wrap the sandpaper it works a lot easier too. Step 9: measure how much ribbon you need to wrap around the outside, and cut it. Step 10: go back outside and spray the board. Quickly put the picture on top, getting edges as even as possible. Wrap the ribbon around the outside (hum, no picture of that part, sorry. The point of the ribbon is so you don't see the yucky foam board edges. I suppose you could paint it instead, but that would mean you'd have to spend more time making the edges look nice. Slapping some ribbon on was a lot faster.) I had enough spray just land on the edges to make it stick. You could also do this part with a glue gun, but I was too lazy to heat mine up. 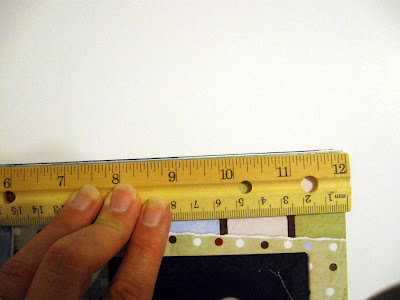 Step 11: Measure out 10" of ribbon for a hanger. I glued mine 1.25" from each edge. 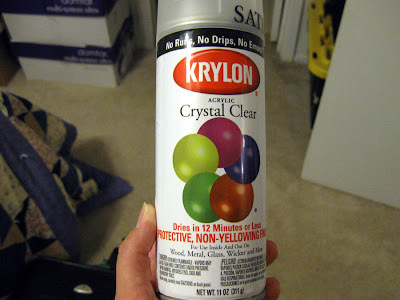 And yes, I was super lazy and stuck mine on with the spray adhesive. And then I figured out that the adhesive stays sticky. 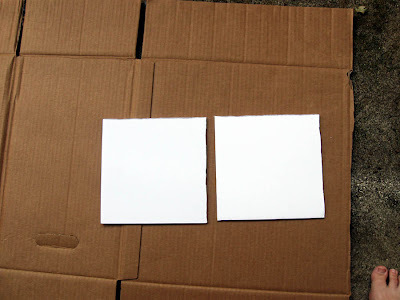 So I cut a regular piece of paper slightly smaller than my square and put it on the back. So it will be a bit more scratch resistant. Tada! Once I had the picture printed and all my supplies, I honestly did this in less than 30 minutes. And the whole thing only cost me $10 including the spray adhesive. Not too shabby. You're funny -- I didn't even notice your toes until you said not to look at them. And then I couldn't look away. Sorry! If you care about your grandpa, better give him the Just5 cell phone. In just a press of the phone’s SOS button, his life can be saved already when in an emergency. The SOS button can power up a loud alarm and dialing features. Plus, the phone is easy for him to use despite his eyesight because of its bright display and large keys. Check this affordable phone at www.jsut5..com.